Rep. Alexandria Ocasio-Cortez (D., N.Y.) spoke Saturday at an event focused on eliminating private education and boycotting "racial" and "gender-biased" standardized testing. The "Education Town Hall" organized by Jackson Heights People for Public Schools included a medley of New York's progressive organizations. NYC Opt Out, New York State Association for Bilingual Education, Network for Public Education, Class Size Matters, Alliance for Quality Education, and Allies for Public Education participated. During the event, Diane Ravitch, professor at New York University and former U.S. assistant secretary of education, spoke with the others opposing private and charter schools, Jacobin magazine reported. Ravitch characterized support for private education as "anti-democratic efforts to privatize public goods," according to the democratic socialist publication. In response to New York's practice of evaluating candidates for top schools through standardized tests, Ravitch called for parents to boycott the tests. Likewise, Opt Out, which had a representative on the panel, seeks to "organize a boycott of the annual state tests." It has called standardized tests "destructive" and "flawed." Panelists claimed the tests were biased against women and racial minorities. Some singled out the Specialized High School Admissions Test, the SHSAT, which the city uses to place top students at more advanced schools. During Ravitch's comments, Ocasio-Cortez "nodded in agreement," according to Jacobin. Some in attendance, however, "were dismayed that AOC didn’t take a position on the specialized high school exams." Jacobin, after slamming the "neoliberal" Democrats who supported improving education through competitive and responsive education options like school choice and charter schools, wondered: "Would AOC similarly disappoint?" "Spoiler: She did not, at least not on Saturday," Jacobin reported. "Instead, she came out firmly against the privatization agenda, and urged parents to organize to have the testing mandate removed from federal education policy." During her remarks, Ocasio-Cortez claimed her teaches doubted her academic abilities until she took a "high-stakes" test and placed in the "99th percentile." According to Ravitch, however, Ocasio-Cortez's claim sparked "controversy" during the event. In a blog post generally praising the congresswoman, Ravitch notes Ocasio-Cortez could not be telling the truth about her test experience. The "high-stakes" test, she explains, is not scored by percentile. There was much talk about the importance of parents taking action by opting out of state tests. NYC has one of the lowest opt-out rates in the state, in some part because parents are warned that they won’t be admitted to the middle school or high school of their choice without test scores. It was a bit jarring to hear AOC say that she was treatedin the Yorktown schools as in need of remedial education because she was Hispanic, not mainstream, but, she said, "a-high-stakes standardized Test" revealed she was in the 99th percentile. No one stopped to point out that she could not be referring to any high-stakes test used for accountability purposes because they don’t rank by percentile. They classify students as 1, 2, 3, or 4. Her teacher must have given her a no-stakes individual test that produces a percentile ranking for diagnostic purposes. Well, she can’t know everything about everything. None of us do. The other controversy at the event, according to Ravitch, centered on the large group of Asian-American parents unhappy with the push to deemphasize testing in the school process. She recounts how "a group of protesters stood up and held signs saying that any effort to change the entrance exams would be ‘anti-Asian bias.'" New York City Mayor Bill de Blasio (D.) has suggested eliminating the entrance examination for the most in-demand schools. Some parents in attendance held signs describing the plan as "progressive racism." As Ocasio-Cortez pointed out, black and hispanic students are better represented in the broader student pool than in highly selective schools. Nevertheless, Asian students reverse this trend. Their parents fear that an overhaul of the system will artificially deflate their admissions numbers. Race-based admissions practices that look beyond academic performance have already had this effect. Harvard University came under fire last year for giving Asian applicants lower "personality" rankings so as to cap their admissions rate, irrespective of scores. Ocasio-Cortez blamed the Asian protester's concerns on a "scarcity mentality." Rather than fight for the limited spots in top schools, she argued, families should insist all public schools improve, so as to eliminate the need for specialized schools. She characterized "public education not only as a right but as a blessing, one of the greatest public goods, the greatest gems of a democratic society." Ocasio-Cortez claimed improving New York's incredibly expensive but administratively inept education system could not simply be a local effort. "This needs to be a national movement," she said. "We are seeing it all over the country." 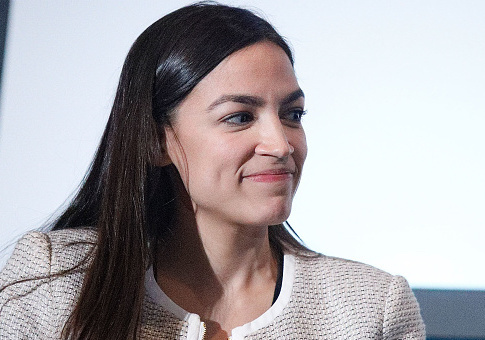 The freshman congresswoman favorably compared the proposed education overhaul to the Green New Deal. That proposal is estimated to cost almost $100 trillion. This entry was posted in Politics and tagged Alexandria Ocasio-Cortez, Education, New York City. Bookmark the permalink. Mikhael Smits is a Public Interest Fellow and Media Analyst at the Washington Free Beacon. He's interested in law, security policy, and today's outrage. Reach him on Twitter @mikhaelsmits or smits@freebeacon.com.